Dr. Manik Pradhan, Associate Professor at S. N. Bose National Centre for Basic Sciences, Kolkata has been selected for the prestigious Innovation award-2017 by the World Indian Diabetes Foundation (WIDF) for his innovative scientific accomplishments towards the development of novel biomarkers for diabetes mellitus. Dr. Pradhan has made several outstanding contributions in the field of experimental laser spectroscopy and new-generation biomedical diagnostics through human breath analysis. He is also recognized internationally for his innovative application-driven basic research in biomedical science and clinical diagnostics. The WIDF Innovation award-2017 will be presented to Dr. Pradhan at the annual meeting of the International Diabetes Symposium at Mumbai during January 7-8, 2017. Dr. Anjan Barman, Professor at the S. N. Bose National Centre for Basic Science, Kolkata has been selected to receive the MRSI medal for 2017, in recognition of his outstanding contribution in the fields of Magnetic Nanomaterials, Ultrafast Spin Dynamics and Spintronics. Professor Barman has done some pioneering works in the development of time-resolved magneto-optical Kerr effect microscopy, ultrafast spin dynamics of single nanomagnets, two-dimensional magnonic crystals, Gilbert damping study of magnetic multilayers and magnetic vortex dynamics. His works are internationally recognized. The MRSI Medal will be presented to Professor Barman at the Annual General Meeting of MRSI, to be held at IIT Mumbai during February 13-15, 2017. 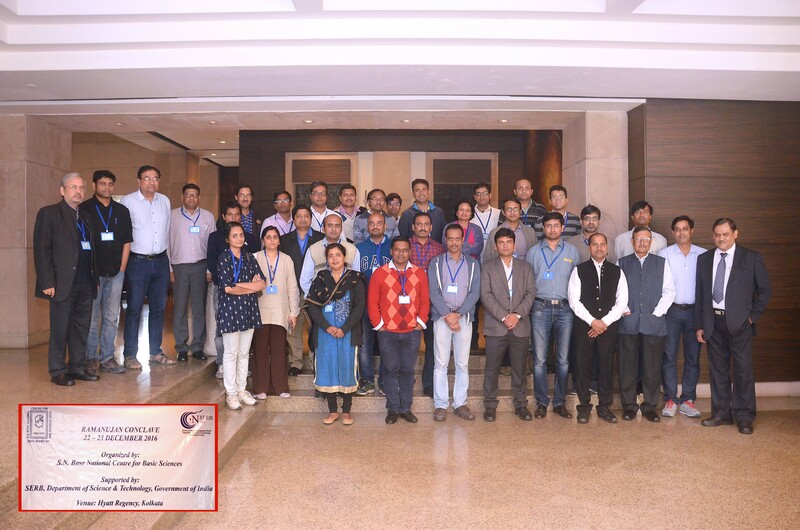 Ms. Jayita Patwari, JRF of the Centre has received best poster award in the DAE BRNS-Theme Meeting on Ultrafast Science-2016 (UFS-2016) held at Bhaba Atomic Research Centre, Mumbai, India during November 24-26, 2016 for presenting poster on "Photo-Induced Electronic Properties in Single Quantum Well System: Effect of Excitonic Lifetime". Out of 53 posters the best poster award was given to 4 participants. Ms. Jayita Patwari is one of them. Ramanujan Conclave is organized by S N Bose National Centre for Basic Sciences at Kolkata from 22nd to 23rd December, 2016. It is supported by SERB, DST, Govt. of India. Astrophysics and Cosmology Department of S.N. Bose National Centre which has a 14" and a 8" telescopes will be housed in the newly built roll off roof observatory. This will soon be made fully functional to carry out some astronomy projects and continue the outreach programmes. 2. Prof. Sandip Chakrabarti, the Head of the Department of Astrophysics and Cosmology of S.N. Bose Centre in close collaboration with ICSP is ready to send the first X-ray astronomy payload on board a Lunar Lander scheduled to be launched in December, 2017. Bangaluru based NGO TeamIndus is building the Lander and the launching would be through a PSLV rocket. The Science objectives are to carry out experiments for the first time to observe X-ray and gamma-ray behaviour of the Sun, black holes, neutron stars and gamma-ray bursts from the lunar surface. Unlike earth based satellites, where is usually interrupted every hour due to prolonged earth occultation, an observer on moon can watch the same source continuously for 14 days. Other equipment with accompanies it would be an Ultraviolet detector by Bangalure based Indian Institute of Astrophysics apart from two moon rovers, one made by TeamIndus and the other by Japanese organization, which are expected to move around on lunar surface. This will be the first effort ever where a private-government initiative would be used to complete the payload. Prof. Chakrabarti and the project engineer of ICSP Mr. Debashis Bhowmick handed over the 1:1 sized model of the instrument to the team for further analysis. 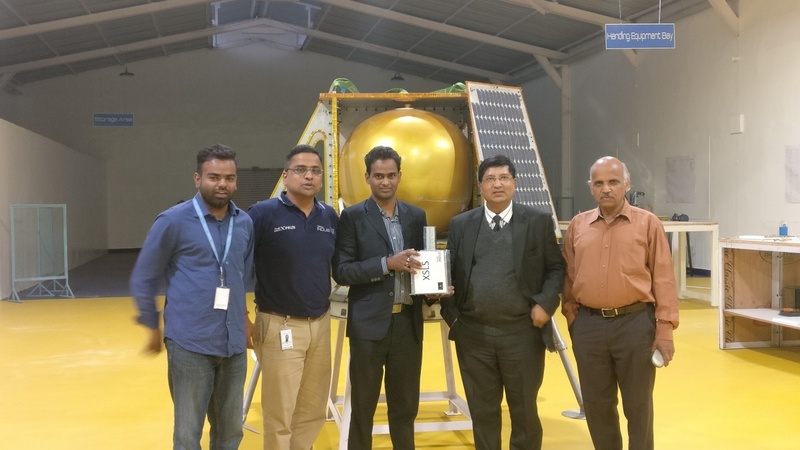 Prof. S. K. Chakrabarti (SNBNCBS, second from right) and Mr. D. Bhowmick of ICSP (with Payload) in front of the moon lander along with TeamIndus officials.